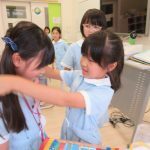 Today, the 2nd grade students showed the 3rd grade students how to play games that they made in Japanese class. The main goal of the lesson was to get the second graders to properly explain directions using the correct expressions of order. 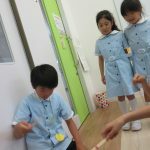 The 3rd graders had lots of fun playing with the 2nd graders’ games and receiving the prizes and medals that they made. It was a great opportunity for the classes to interact with one another. Copyright ©aichikokusaigakuen All Rights Reserved.